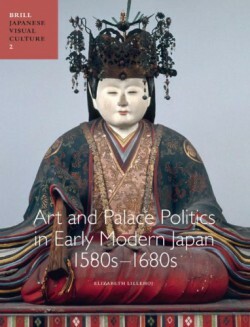 During the first century of Japan’s early modern era (1580s to 1680s), art and architecture created for the imperial court served as markers of social prestige, testifying to the enduring centrality of the palace to the cultural life of Kyoto. Emperors Go-Yōzei and Go-Mizunoo relied on financial support from ruling warlords – Toyotomi Hideyoshi and Tokugawa shoguns – just as the warlords sought imperial sanction granting them legitimacy to rule. Taking advantage of this complex but oftentimes strained synergy, Go- Yōzei and Go-Mizunoo (and to an unprecedented exent his empress, Tōhokumon’in) enhanced the hereditary prerogatives of the imperial family. Among the works described in this volume are masterpieces commissioned for the residences and temples of the imperial family, which were painted by artists of the Kano, Tosa and Sumiyoshi ateliers, not to mention Tawaraya Sōtatasu. Anonymous but deluxe painting commissions depicting grand imperial processions are examined in detail. The court?s fascination with calligraphy and tea, arts that flourished in this age, is also discussed in this profusely illustrated volume. Elizabeth Lillehoj (Ph.D., Columbia University) has been teaching the history of Japanese art at DePaul University since 1988. She has published extensively on issues of court and elite warrior patronage of art in early modern Japan, and is the editor of Critical Perspectives on Classicism in Japanese Painting, 1600-1700 (University of Hawai’i Press, 2004) and Acquisition: Art and Ownership in Edo-Period Japan (Floating World Editions, 2007).